Activist Arvind Kejriwal's civil disobedience campaign seems to be building up with people in many parts of the city today setting power bills on fire. While the day offered a platform to the people to vent their anger, India Against Corruption (IAC) members continued their attack on the Sheila Dikshit government and alleged a nexus between the government and the private power companies. Three men, including a Delhi University graduate, were arrested today for allegedly cheating about 400 people from Bihar, West Bengal and Haryana by promising them jobs with the Indian Railways. The Delhi police today arrested three more suspects in the cash van heist that took place in Defence Colony on September 9 and recovered Rs 25 lakh. So far, the police has recovered Rs 2.69 crore. The accused have been identified as Vijay Pandit alias Shyam, Pawan Kumar, alias Pappu, and Ranjit. An annual run for a healthy heart - a 5-km run titled ''Dil ki Daud'' - organised by the Billion Hearts Beating Foundation and Indraprastha Apollo Hospital today saw a participation of over 2,000 people. The 13th All-India Police Band Competition-2012, which is being organised by the Border Security Force (BSF), was inaugurated by Union Home Secretary RK Singh here today. Will CP shop owners see the light at the end of the tunnel? Just who is responsible for the delay in restoring Connaught Place--or the rechristened Rajiv Chowk and Indira Chowk--that has been lying in a shambles for nearly three years? Four unidentified men opened fire outside the office of a BJP MLA in Trilokpuri, East Delhi, today but no one was injured, the police said. A man was killed when an overspeeding car hit a mini-truck at the Feroze Shah Road crossing this morning. Activist Arvind Kejriwal's civil disobedience campaign seems to be building up with people in many parts of the city today setting power bills on fire. While the day offered a platform to the people to vent their anger, India Against Corruption (IAC) members continued their attack on the Sheila Dikshit government and alleged a nexus between the government and the private power companies. During the day, Kejriwal and his associates dared the government and pushed the "bijli-pani satyagraha" further by restoring several power connections in places like Bawana, Mahipalpur, Mayur Vihar and urged the people to prepare themselves for going to jail. Taking the Chief Minister head-on, Kejriwal demanded that an FIR be lodged against her and private discom for allegedly pushing Kailash Chandra, a resident of Najafgarh, to death. Chandra was accused of tampering with the electricity metre. He died due to a heart attack following a raid carried by the electricity office on his house at Satyam Puram, Jharoda Khalan near CRPF camp. He was allegedly told to pay Rs 1 lakh as bribe. Arvind said, "His wife alleged that a team from the electricity office had asked for Rs 1 lakh as bribe. Officials told him if he does not pay, they will take him to the court. Chandra collapsed and his wife rushed him to hospital where he died. Even after three days, no FIR has been registered. Isn't this a murder when an FIR should be lodged against Sheila and Reliance Company's Anil Ambani?" he asked. IAC activists attacked Sheila for the escalated tariffs, with the latest being two per cent in May this year despite a 2010 order of the Delhi Electricity Regulatory Commission recommending a reduction in electricity charges. While Kejriwal asked the people to prepare for the worst, Gopal Rai led the protest at Laxmi Nagar, Kumar Vishwas engaged the public in Mukherjee Nagar and Manish Sisodia did his job in Mahipalpur. Earlier at Acharya Niketan, Mayur Vihar Phase-1, IAC activists restored the snapped power supply of Himanshu Goyal who was served with a bill amounting to Rs 29,880 and his electrical connection was disconnected without a notice. Himanshu said his monthly bill used to be between Rs 7,000 and Rs 8,000, but this time it shot up and the power was cut 10 days ago. While addressing the public at Mayur Vihar, Gopal Rai said, "Sheila Dikshit will be tired of disconnecting the power connections, but we will keep restoring them. The protest will continue and people will burn the electricity bills in 114 municipal wards. If the government doesn't roll back the hike, we'll surround the Chief Minister's house." The police claims that the arrestees had created a fake website of the Indian Railways Recruitment Board to lure their victims. Additional deputy commissioner of police (South district) PH Khushwah said the accused have been identified as Sagar Saxena (32), Pravin Kumar (24) and Virender Sharma (29). They are residents of Delhi. According to the police, Sagar has completed his BCom from Allahabad University and is trained in computer software and developing websites. Kumar has completed his BCom through correspondence from Delhi University and Sharma has pursued MBA from City College at Gwalior. Khushwah said, "We have busted a gang that has duped about 400 people from Bihar, West Bengal and Haryana on the pretext of providing them jobs with the Indian Railways. They had created a fake website of the Indian Railways Recruitment Board and charged Rs 1 lakh to Rs 1.5 lakh from each candidate for providing them a job under categories C and D of the Railways." On September 12, a case regarding the matter was registered at the Kazi Mohmadpur police station at Muzaffarpur in Bihar. The complainant is the Railway Bharti Board. After the arrest of the three persons, the police learnt that they worked in connivance with one Manish of West Bengal. They together created and uploaded a fake website- www.irrb.org/muzaffarpur/- which resembled the original website of the Railway Recruitment Board at Muzaffarpur. On the fake website, they uploaded the roll numbers of the candidates, by copying them from the original website, and showed that they had qualified for the board. Thereafter, they contacted these candidates and pretended to be railways officials and collected money from them on the pretext of providing them jobs. "Saxena had designed the website, Kumar arranged for the domain name for hosting it and Sharma chose names and roll numbers of some candidates. Manish collected money from the victims. He is presently absconding," said Khushwah. The Delhi police today arrested three more suspects in the cash van heist that took place in Defence Colony on September 9 and recovered Rs 25 lakh. So far, the police has recovered Rs 2.69 crore. The accused have been identified as Vijay Pandit alias Shyam, Pawan Kumar, alias Pappu, and Ranjit. On a tip-off, members of the Special Task Force raided "Sethi General Store" in Usmanpur in North-East Delhi and arrested Ranjit and recovered Rs 15 lakh from his house kept in a gunny bag. His interrogation revealed that the balance cash might be in the possession of the younger brother of a co-accused, Pawan Kumar, an employee in BSES. The team raided at the house of Pawan in Sudamapuri near Usmanpur and recovered Rs 10 lakh from his house and arrested him. On their disclosure, Vijay was arrested from Palwal bus stand where he came to meet one of his relatives. One Maruti Car (DL-3C-C 3293) which was used in committing the crime was seized from his possession. For recovering remaining cash and weapon used to commit the offence and to arrest other co-accused, the police raided hideouts in Rewari and Gurgaon where one of their close associates, whom Vijay had given weapon and remaining cash, live. But, he managed to flee before the team could reach there. The efforts are being made to arrest him. Till now, 10 persons have been arrested in this case. During interrogation, Vijay said that he got Rs 90 lakh as his share. The police said that Vijay had played an instrumental role in the robbery, starting from conspiracy stage till the final distribution of looted cash amongst all. After commission of crime, he collected his share of booty and reached his house in Maidangarhi. Thereafter, he took his wife and ailing child and fled to Gurgaon. He gave two major portions of looted money to his two relatives and went to Mewat to seek new hideouts and has been on the run since then, knowing that the police would be close on his heels, the police said. Among those in the race, which was kicked off at 6.45 am, were India's first blade runner and Kargil War hero Major (Retd) Devender Pal Singh along with former wrestler Satpal Singh and the famous cricketer, Gurusharan Singh. The idea behind the event is to spread awareness about heart diseases and motivate people to take steps towards a healthy lifestyle. There were students from schools and colleges among whom enthusiasm was evident, apart from members of the resident welfare associations, various corporate houses, delegates from embassies and staff of Apollo Hospital, which too ran the marked distance for the healthy heart run. About 12 million people die of heart disease every year in India. According to the World Health Organisation, while the rest of the world enters the heart attack zone at around 55 years, Indians become susceptible at 35 years of age. Heart disease and stroke are the world's leading cause of death, claiming 17.3 million lives annually, with the numbers rising year on year. Thirteen bands of police forces of different states and seven of the Central Armed Police Forces (CAPFs) consisting of musical instruments such as the brass band, bagpipes and drums will be participating in the four-day event. Singh while speaking to the public at India Gate said, "The bands have always remained an integral part of the police regiments. The music played by the bands, especially the bagpipes, has motivated men during the battles. And the spirit of the bands has still reigned supreme." The opening ceremony was conducted at India Gate this evening. Seven groups consisting of different bands of the states police force and CAPFs participated at the ceremony. The first group comprised the Assam Rifles, Madhya Pradesh police and West Bengal police, who together played a song named "Dil diya hai jaan bhi denge, aae watan tere liye". Another group consisting of the Indo-Tibetan Border Police, Railway Protection Force and Sashastra Seema Bal played "Kadam kadam badaye jaa". A squad of the Central Industrial Security Force, Jammu and Kashmir police and Uttar Pradesh police played "Aae mere watan ke logon". 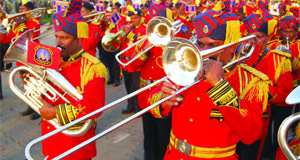 The last group comprising the police force of Maharashtra, Andhra Pradesh and Tamil Nadu played "Vande Mataram". The other participants included the BSF, police force of Haryana, Punjab, Sikkim, Jharkhand, Delhi and Rajasthan and Central Reserve Police Force. All the bands together played "Sare jahan se acha Hindusitan hamara", after their own individual performances. Director General (BSF) UK Bansal while talking to mediapersons said, "I hope the general public enjoyed the performance and will see the police forces of the country in a better light." Interestingly, the historical reference reveals that it took nearly four years for the British to build it between 1929 and 1933 and perhaps it would take as many years to restore the splendours of the Georgian architecture. Well, if one goes by the reason put forward by the New Delhi Municipal Council (NDMC) tasked to beautify the area ahead of the October 2010 Commonwealth Games, the blame is on the high level of footfalls the area receives every day. It is two years since the Games got over, but the ambitious restoration work is still under way with December 2012, being touted as the latest deadline amid strong indications that like many times in the past, this deadline too shall pass. before it can give the finishing touches. According to a senior engineer of the agency, the government had planned to make the inner circle of Connaught Place pedestrian-free but it had not imagined the basic problems in a commercial area. The delay has now made the NDMC revise its plan and retain the existing pattern for both the vehicular traffic and pedestrians who throng the inner-circle shopping area. The lacunae reflected in the manner in which the work was distributed. The NDMC had given contract to just one company--Engineers India Limited. Had the development work been divided into a few contractors, it would have been completed on time. Atul Bhargav, president of the New Delhi Market Association, said that the restoration work of Connaught Place began in 2009 and several deadlines were fixed, but none met. The area was originally named after Prince Arthur, the Duke of Connaught by the British, but changed by the Narasimha Rao Government in the late 1990s. Its restoration was meant to showcase the place to the visitors during the Games. The work started in right earnest with the agency deciding to repair the crumbling façade, re-laying roads, drainage lines and parking. Just after the work began, the NDMC realised that it could not meet the deadline with the entire area in a mess as it was dug up at several places. Meanwhile, the project cost itself soared from the original Rs 76 crore to over Rs 1,000 crore. Besides the people, it is the shop owners in the area who have suffered both on account of business and footfalls. The restoration work started in 2009. Since then, show room and shop owners in the inner circle claim to have lost about 10 to 15 per cent business, those in the outer circle between 20 and 25 per cent and the middle circle a whopping 80 per cent. While admitting that the deadlines were missed, NDMC Chief Engineer Anand Kumar sought to justify the slow speed attributing that the work could not be completed fast in an area that is 'live' unlike the one which is less frequented by the people. Defending the planning, he said once the project is completed, those who are criticizing the government will shower praise on it for the quality of work. Well, the visitors to 'CP' have learnt over a couple of years to negotiate their way through the rubble as they go window-shopping or just hang around with friends, hoping that the restoration work will be completed one day. The firing took place early this morning when the office was closed. The MLA, Sunil Vaidya, said that the motive was to kill people inside the office. According to a witness, at 1.30 am, four men on two motorcycles reached outside the office and started firing. Vaidya said that he had been attacked earlier also. He said, "I have been working against the drug peddlers and other criminals who live in the area. The firing may be a warning for me so that I should stop working against them." The deceased Ranjit Yadav (22) worked as a daily wage worker. He was travelling in an open truck, standing at its edge. Following the collision, he fell down and died on the spot. The Maruti SX4 was damaged in the accident, said the police. Vishal Arora (27), a call centre employee, was on the way to his house when he lost control over the car and rammed it into the truck. Two persons, including the truck driver, escaped with minor injuries. A case has been registered at the Parliament Street police station and the police arrested the car driver Vishal, a resident of Ghaziabad. He was later released on bail.